A view of one of, what I believe, is the silent majority. what a pity that they feel threatened when expressing the opinions. JH. is not an ordinary man. J who was born in Haifa identifies himself firstly as an Israeli citizen: secondly as a Christian and lastly an Arab. An Israeli-Christian-Arab in that order. He has a strong conviction that the Jews have a claim on Israel. Two things make Joseph extra ordinary: his thoughts about Jews and his lack of fear in expressing those views. He is 38 years old, married with 4 children, two sons and two daughters. After high school Joseph studied accountancy and business management at Haifa University. 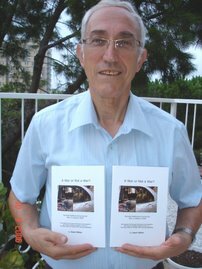 His acquired knowledge helped him build a business making custom made furniture in his workshop in Downtown Haifa. He speaks with pride when he says he owns is own home and can provide for his family. J. admires the Jewish people and calls them ‘brilliant’. ‘From nothing’ he says ‘they have built a great nation’. He sees them as a people with unique God given abilities that think creatively and make good managers in business. He also believes that the Jews have a historical right to claim Israel as their national homeland with Jerusalem as the capital. These views would cost J. his life if spoken in the West Bank or Gaza: even in some Arab communities within Israel he could expect persecution by way of rejection. He states that many Christian Arabs feel this way but are too afraid of speaking out. J. wants a strong Israel. When Israel shows weakness he says Christian Arabs feel insecure. With concern he sites the recent wars and compares them with the Yom Kippur war in 1967 when Israel took Jerusalem for its capital. Since 67 Israel have gained nothing from their battles. He highlights the recent war in Gaza and asks after all the losses on both sides what has Israel gained? Hamas lives to fight again. This he says is a weakness of Israel’s leadership and a recipe for disaster. J. says to survive in Israel a man needs a dream. His dream is to enter into politics and have a place in the Knesset. He speaks of Ghandi, Nelson Mandela and Martin Luther King as men who had dreams and became leaders. Today he is a hard working carpenter: tomorrow could be a different story. It borders on the incomprehensible how the western, educated, cultured, democratic and ‘balanced’ world focuses its media-generated wrath against Israel. Better to remember that no country on this earth is beyond constructive criticism, especially western super-power societies with dubious histories of their own. But – let’s not go there. As is our trademark, I want to share with you something positive so as to offer you a choice on what to focus … something positive and uplifting, instead of depressing negativity. 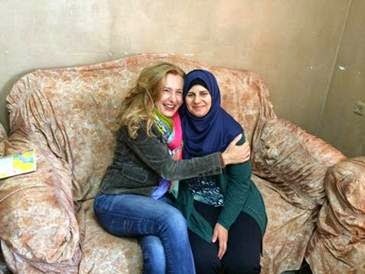 Nivin was born in Ramallah (in the Palestinian Authority), married and now lives with her husband in East Jerusalem. Her battle with breast cancer brought her into the sphere of Sonja Dinner, a Swiss-based international philanthropist who cares deeply about the plight of women in Arab societies. Sonja is providing invaluable support for the creation of Emek’s Comprehensive Breast Care Center and decided to step out of the box and bring Nivin to Emek for a sensitive and necessary surgical procedure. Get the picture? A Muslim Arab woman living in a society where such things are not even openly discussed, from an area that could be the flashpoint for another war, traveling through checkpoints with her Palestinian Muslim husband to Israel’s Emek Medical Center – the mecca of coexistence through medicine – to be treated by a team of Jewish & Arab Israeli physicians for a disease that women in her society suffer from in silence. Nivin, her husband and Sonja met with Emek’s Professor Dan Hershko (Head of Surgery ‘B”) and Dr. Azziz Shoufani (Head of Plastic Surgery). She was examined and later operated on in what proved to be a highly successful procedure. With Sonja’s help and encouragement, Nivin is now a role model for other women in her society and is helping to break through Arab taboos surrounding this deadly disease. Expert medical attention (unavailable in the Palestinian healthcare network) was called for and they came to Israel, to Emek. Another in a long line of Palestinians who have been saved here. I’m proud to be living in a country where offering such help is the norm. I’m even more proud of Emek’s humanitarian professionals who, through their fingers and hands flow the magic of healing and ultimate reconciliation. It is unsensational acts such as these that represent real hope. Do you understand that? Hamas dependants can go to Israeli hospitals but not Gazans! Israel's Coordinator of Government Activities in the Territories, Major General Yoav Mordechai, on Monday accused Hamas of a double standard for allowing the daughter of the group's leader Ismail Haniyeh to receive medical treatment in Israel. "When there is a personal interest, Hamas has no problem in allowing patients to come into Israel," Mordechai said during an interview with the Palestinian news agency Ma'an. Mordecai criticized Hamas conduct during Operation Protective Edge, claiming that the group's leaders prevented injured Gazans from reaching the field hospital set up by Israel on the Gaza border. The hospitalized girl is one of Haniyeh's 13 children. She suffered complications from routine treatment, was transferred to Ichilov Hospital in Tel Aviv via the Erez Crossing, and sent back to her home last week. When Israel receives a request for treatment, it is not interested in the relatives of the patient, whether it's Haniyeh or some other people," said Mordecai. "Haniyeh's daughter is one of more than the one thousand patients from the Gaza Strip and the Palestinian Authority areas, both adults and children, that we treat each year," said Ichilov Hospital in response. A Palestinian source told the Asharq al-Awsat newspaper that the treatment and transfer of the patient had been coordinated with the Palestinian Authority, and that relatives of other Palestinian officials had also been treated in Israel in the past. In his address to the United Nations General Assembly, Palestinian Authority Chairman Mahmoud Abbas proved that he is not a partner for peace. And a Palestinian leader who accuses the State of Israel, which arose from the ashes of the Holocaust, of committing genocide in Gaza, apartheid and ethnic cleansing, has no intention of becoming a partner for peace either. We must not wait for the point in which we have lost control over our future. Our approach is to initiate for our future. Israel`s Contribution to Palestinian Healthcare in 2013. Since 1967, when Israel captured the areas of Judea and Samaria, Palestinian infant mortality has been reduced from approximately 100/1,000 to 13.49/1,000. Gaza: 15.46. Life expectancy has risen by about 10 years. Palestinian Territory’s low rate of Infant mortality also belies any accusation of "genocide". Both the West Bank and Gaza have a lower rate of infant mortality (13.49 and 15.46) than Egypt. (22.41 deaths per thousand births), Syria (15.79), Jordan (15.73) and Turkey (21.43). In spite of all evidence to the contrary, the enemies of Israel and the enemies of truth continue to bandy about spurious accusations of "genocide". Massacre? Genocide? “Do not care”? You decide. Due diligence: for each patient, one permit was issued for a family member accompanying the patient. Thus for 2013 there were about 110,000 patients (over 400 each weekday) and about 120,000 permits for family members. In emergency situations the rapid transfer of patients in dire need of advanced medical treatment to be examined in Israeli hospitals is permitted. In 2013 the number of emergency medical evacuations rose, with Israel providing 2,207 evacuations by ambulance (up from 600 in 2012) and 11 medical evacuations by helicopter (up from 10 in 2012). Israel also arranged for the overseas treatment of five Palestinians whose medical needs were unable to be met in Israel. The number of Palestinian children from the West Bank who received medical treatment in Israel in 2013 stood at 40,000, an increase from the previous year's 21,270. Israel was responsible for the coordination and funding of 10 "fun days" for 250 Palestinian children, who were also joined by members of their families. Israel spent more than a million NIS to provide various treatments for dozens of Palestinian children hailing from families unable to afford the necessary medical bills (probably unable to afford Palestinian health insurance payments). Yakub was born at Sharei Tzedek Hospital (Jerusalem) in Israel and was immediately diagnosed with acute kidney failure. His condition led to several other medical problems, and he had to undergo several treatments in the hospital. None of his family members were compatible donors, so the family, completely despondent, turned to Dalia Basa, the Israeli Health Coordinator with the Palestinian Health Authority for help. Three days after Dalia met with the child, a donor was found: a deceased Israeli child whose parents had agreed to donate his kidneys. Immediately, Yakub was transferred to Schneider Medical Center (Petach Tikva) for the life-saving transplant. The operation and medical expenses at Schneider were covered by Israel, at the cost of 200,030 NIS. Since the surgery Yakub has maintained perfect health. Israel promotes the development of the Palestinian health system through several different programs and training. In 2013, 2,314 Palestinian doctors, nurses, and other medical health care professionals attended 159 courses, conventions and programs that Israel hosted. Israel provides a special program for training physicians, nurses and technicians at Israeli hospitals, for the sake of operating hospitals in Judea and Samaria, and to improve the Palestinian health system. Hadassah Ein Kerem Hospital (Jerusalem) trains 60 Palestinian interns who are replaced every year. Also, technicians and nurses from the Bet Jala Hospital (Palestinian Authority) are trained in cancer treatment, while a program operates out of Augusta Victoria Hospital regarding diagnostic medicine. During May 2013, the Palestinian Minister of Health, Dr. Hanni Abadin, paid an unprecedented visit to Hadassah Ein Kerem Hospital in Jerusalem. Dr. Abadin thanked Hadassah for the opportunity to visit and for its services, visited Arab children hospitalized at Hadassah and gave them gifts. The Erez crossing is open between the hours of 08:00-16:00 Sunday through Thursday, and 08:00-14:00 on Fridays. However, it is staffed 24/7 in the event of emergency. In 2013, 13,734 permits for healthcare in Israel were granted, of these - 4,519 were in need of specialized medical transport, which was provided for them. Despite frequent claims that Israel turns away ambulances carrying people in desperate need of medical services, in 2013, out of the 1,189 ambulances which requested permits, 1,188 received them, and only one was refused. Amongst the Gazan residents treated in Israel were the sister and granddaughter of Hamas`s leader, Ismail Haniyeh. In 2013, Israel coordinated the entrance of 2,311 truckloads of medical supplies, carrying thousands of tons of medical equipment into the Strip. Included in these shipments were large amounts of polio vaccines, as periodic tests turned up positive for poliovirus in the area. In order to ensure the health of residents in Gaza, Israel took special measures to ensure sufficient shipment of the needed vaccine. How did Hamas make payment for these healthcare services? In 2013, a relatively quiet year, there were only 41 rocket attacks on southern Israel. Mudar Zahran is a Palestinian writer and academic from Jordan, who resides in the UK. terrorizes and kills us just like Daesh [ISIS] terrorizes kills Iraqis. Hamas is a dictatorship that kills us. The Gazans you see praising Hamas on TV are either Hamas members or too afraid to speak against Hamas. Few foreign [Western] journalists were probably able to report what Gazans think of Hamas."